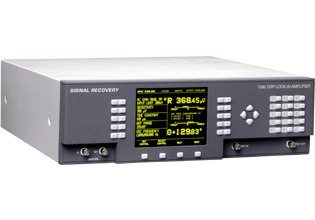 The model 7280 DSP Lock-in Amplifier is the widest frequency band offered by Signal Recovery. The 7280 offers direct digital demodulation over an operating frequency range from 0.5 Hz extending up to 2.0 MHz. The instrument has output filter time constants down to 1 µs and a main ADC sampling rate of 7.5 MHz it is ideal for recovering fast changing signals. The 7280 works in the traditional audio frequency band unlike other high frequency lock-ins. The front panel offers a large easy to read display used both to show the instrument's outputs and for adjusting its controls via a series of menus. Controls are set by a combination of the use of the keys surrounding the display and the keypad, while four cursor-movement keys simplify use of the graphic display menus. The 7280 includes the extended operating modes like dual reference, dual harmonic and virtual reference, as well as the spectral display mode used to aid reference frequency selection. It also includes GPIB and RS232 interfaces for remote computer control and a range of auxiliary analog and digital inputs and outputs. Software support is available in the form of a LabVIEW driver supporting all instrument functions, and the Acquire™ data acquisition software. The driver and a demonstration version of the software, DemoAcquire, are available for download from this site. Function X, Y, R, Θ, Noise, Ratio, Log Ratio and User Equations 1 & 2.